"SINGALONG" is my weekly music, singing and movement class for babies, toddlers and children under five. Each week's singalong has a theme to keep the little ones - and the big ones! - interested and engaged. Popular themes include Space, Jungle, Farm, Pirates, Garden Creatures, Fairy Tales, Circus, Family and Wild West. We also cover seasonal themes like Christmas, Hallowe'en, World Cup, Easter, Autumn, Winter and Summertime. Do feel free to join in with fancy dress - Hallowe'en is always great for costumes - but don't feel obliged, it isn't compulsory! You can get an idea of past themes from the themes page or by viewing the picture gallery on this website, or checking out my Facebook page or YouTube channel. 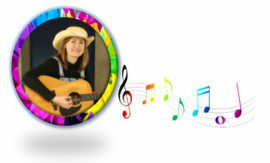 ​My Singalong classes are about a lot more than just guitar-led singing! I have a selection of musical and percussion instruments which give my little singalongers the opportunity to explore new soundscapes and rhythms, joining in in whatever way they can - banging, tapping, singing, dancing or just gurgling. These instruments include drums, xylophone, chimes, cowbells, shakers, tambourines and rhythm sticks. Action songs and rhymes get everyone moving and laughing, and I often read a story to calm us all back down again. I also bring a variety of toys and dress-up materials linked to the theme to cater for a multi-sensory learning environment. ​Classes operate on a term basis, with limited drop-in availability. Most parents/carers choose to book a full term as their children benefit so much from the experience. The regular music classes help their little ones grow in confidence socially, emotionally and musically, making new friends while they learn to make music and remember lyrics and movements to action songs. Their language skills develop, and even the babies repeat what they've learned when they go home for all the family to enjoy and admire! Older children attending my classes start nursery/school knowing their counting songs, months of the year, etc., and have an embedded understanding of rhythm and rhyme that aids their confidence. I try my best to create a magical, musical and visual experience for the children and most of all, to ensure that they have a really FUN 45 minutes!! ​I currently run four classes per week at Rose Theatre Kingston / Cornerstone Hub Hall - you can find information on term times and themes by clicking the button below. Both venues are easily accessible, offering excellent changing facilities and with ample space for buggy parking. In addition to my weekly classes for babies, toddlers and children under five, I offer nursery and school workshops or assemblies and you can also book me as a children's entertainer for birthday parties or special events. Private guitar lessons for children are also available.